St. Andrew Catholic Church presented its annual Martin Luther King, Jr. Awards at Mass on Sunday, January 20. These awards are given to people whose service embodies the values of Dr. King, who used nonviolence, civil disobedience, and Christian teaching to advance the cause of civil rights in America. 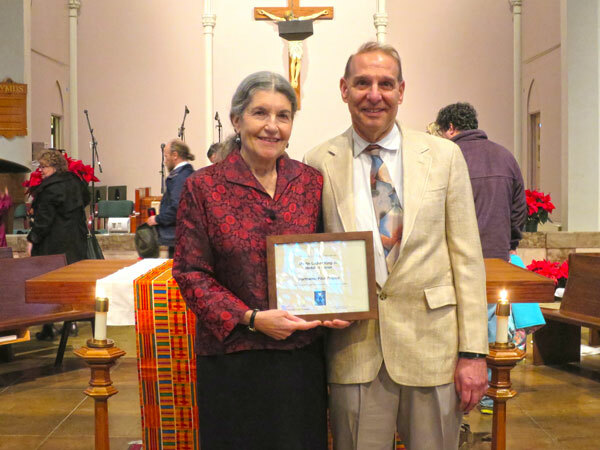 Two awards are given each year honoring a parishioner and also a community group for their works of social justice in the church and in the greater metropolitan area. The Community Service Award went to Bobby Weinstock and Susan Emmons of Northwest Pilot Project who have a combined 60 years of service to elderly people who live in Portland’s downtown. Weinstock’s remarks were a litany of gratitude for all the people—volunteers, staff, donors and the clients themselves—who make NWPP’s many programs successful. Over the years, the agency has relocated hundreds of elderly and disabled tenants who were threatened with homelessness as their apartment buildings were demolished or gentrified. Weinstock has thirty years working as Housing Specialist for NWPP. Emmons told a story about a demonstration organized by NWPP in 1998, when Portland City Hall was reopened after a $30 million remodel. Elderly people from across the city greeted City officials at the official opening in order to request a set-aside of money for low-income housing. “We weren’t too popular,” Emmons recalled. “One 93-year-old lady asked me if we would get arrested, and I told her that was unlikely, since it is not illegal to come to City Hall. She looked disappointed, and I asked her, ‘Did you want to get arrested?’ ‘Yes,’ she told me. ‘It would be a wonderful story to tell my grandchildren.’” Emmons, who served the agency as Executive Director, retired at the end of 2016. Parishioners submit names and a dedicated committee provides the research necessary to choose the honorees, and produces the ceremony at Sunday Mass. This year John Wolfe co-chaired the MLK Committed with his wife, Korinna Wolfe. Tony Jones served as Master of Ceremonies, and Patrick Elijah presented the winners with certificates and medallions engraved with the image of Dr. King. Rev. Charles Wood was celebrant of the mass and Rev. Charles Lienert was concelebrant. 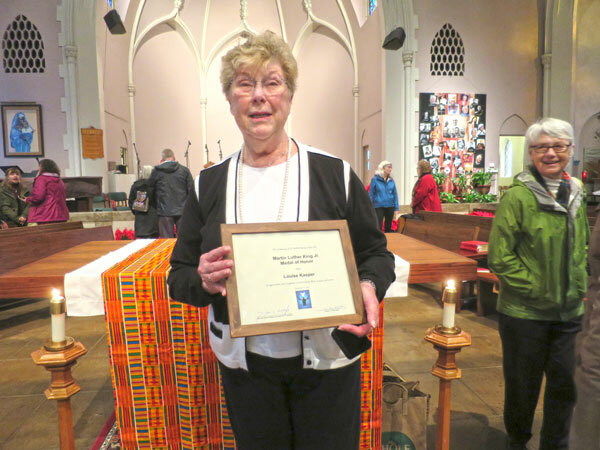 Louise served as Liturgy Coordinator, was a member of the Pastoral Council and, for many years, she coordinated volunteers who delivered Christmas food baskets. In her retirement, Louise tutored readers at Martin Luther King, Jr. School and led a parish book drive and sale that netted $1,400, providing a book for every student at King School for two years. Louise said her years of working with Fr. Bert Griffin and Holy Names Sisters Sidney Thomison and Kathleen Stupfel taught her the value and strength of an active and involved community which extends beyond parish boundaries. This past summer at Holladay Park Plaza, she coordinated a drive for hygiene items for residents of Right 2 Dream Too, a houseless community near the Rose Quarter, contributing more than 2,500 individual items for R2DToo residents. Northwest Pilot Project is a social service agency providing services to elderly, disabled, homeless and poor people in downtown Portland. 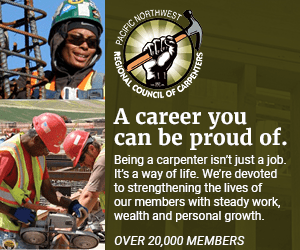 Since its beginnings in 1969, NWPP has been the city’s most visible watchdog of an ever-diminishing stock of rental properties affordable to the poor. In 1990, NWPP was honored at a White House ceremony for its innovative Aging Services Program. Susan Emmons was been one of our city’s earliest advocates for maintaining and building affordable housing downtown, especially as poor and elderly tenants found themselves in the path of gentrification. For three decades, she called public leaders to account as money was spent on aerial tram, esplanade, bicycle paths, meanwhile the numbers of homeless people swelled. In print and in person, Susan shamed those who insisted Portland had no money to house the poor. In 1989, Bobby moved over to NWPP as its first Housing Specialist. Over the years, in addition to being an indispensable collaborator and sounding board for Susan, he created a Downtown Portland Affordable Housing Inventory; supervised the safe relocation of tenants threatened with building closures; designed programs to enable the homeless to become successful renters; acted as a liaison between the Housing Authority of Portland (today Home Forward) and the V.A. to build a safety net for homeless veterans; and piloted a program in collaboration with Urban League to keep elderly renters in their apartments as rents rise.